Truly innovative design concepts pushing utilization of high-strength steels to the limits characterize this year’s four finalists for the Swedish Steel Prize. The winner will be announced at a ceremony in Stockholm on May 11. “This year a record number of 102 applications were sent in from 32 different countries around the world. The high overall quality of the applications shows that this prize has an important role in promoting and even encouraging the industry to find new and innovative ways to use high-strength steels for higher performance,” says Eva Petursson, Chairman of the Swedish Steel Prize jury and head of SSAB’s strategic R&D. Fermel has developed a unique range of multi-purpose vehicles for safe transportation in mines. The vehicles meet new, more stringent safety legislation and are intended to replace the re-built standard vehicles currently used. Design optimization of the entire vehicle, including the car body, has given superior performance regarding personal safety, higher payload, agility, damage resistance, reliability and service life. All these benefits are achieved by extensive use of advanced high-strength structural and wear-resistant steels. JMG Cranes has developed a unique, highly compact crane with an extended field of application. The lean design combined with electric drive train and excellent maneuverability allows it to be used both indoors and outdoors. This powerful pick and carry crane has great lifting capacity. Its high performance to weight ratio has been obtained by optimized boom design utilizing ultra-high-strength steels. Additionally, efficient road transportation is made easy by removable support legs and counter weights. 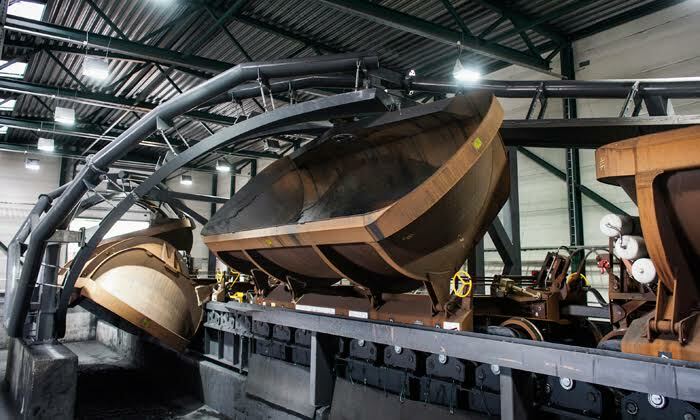 Kiruna Wagon has developed an innovative dumper wagon system for long-haul rail transport and efficient unloading of minerals. Use of advanced high-strength structural and wear-resistant steels made it possible to design lightweight wagons combined with a stationary Helix terminal for on-the-fly rotary unloading. With its nearly doubled unloading rate, the Helix system is superior to all conventional solutions and solves many problems related to sticky aggregates. The terminal system is very cost effective, in terms of both investment and operation. Wabash National’s new rear impact guard for trucks and semi-trailers exceeds North American standards also for demanding off-set impact. The optimized design utilizing high-strength structural steel has been verified through extensive full-scale testing that shows superior performance in protecting the people in the colliding car. The patented system gives excellent energy absorption, minimum damage to the heavy vehicle as well as highly cost-effective manufacturing and assembly.